Prosperity: The Choice is Yours -- Free online business ezine, articles, and training. 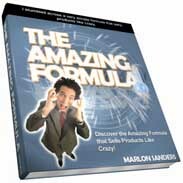 The Amazing Formula That Sells Products Like Crazy reveals a simple, proven formula that has helped Marlon Sanders, his friends and clients to sell thousands of products both online and off. You'll discover actual examples of multi-million dollar online businesses using variations of the formula. What to do tomorrow morning to begin selling your products like crazy. The secret of getting 1,000 referrals at a time. The method one guy used to build a million dollar business for a big cash-out. with over 100 pages of testimonials.